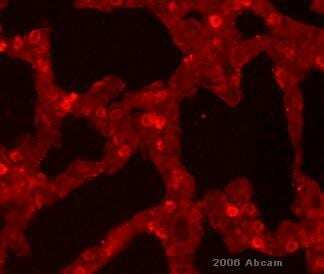 Recombinant full length protein corresponding to Human Surfactant protein D/SP-D.
Epithelial cells of the lung, skin, small intestine, esophagus, gall-bladder, kidney and urinary bladder. Previously labelled as Surfactant protein D.
Our Abpromise guarantee covers the use of ab17781 in the following tested applications. IHC-Fr 1/500. 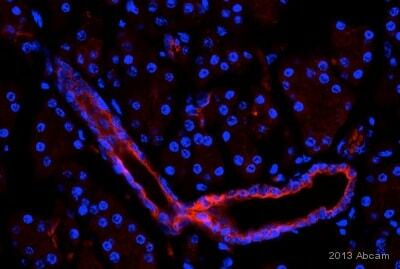 For 16 hrs on perinatal mouse lung samples (see Abreview for further details). WB 1/20000. Predicted molecular weight: 37 kDa. ab17781 reacts strongly with Surfactant protein D/SP-D, both in reduced and non-reduced forms. Contributes to the lung's defense against inhaled microorganisms. May participate in the extracellular reorganization or turnover of pulmonary surfactant. Binds strongly maltose residues and to a lesser extent other alpha-glucosyl moieties. Belongs to the SFTPD family. Hydroxylation on proline residues within the sequence motif, GXPG, is most likely to be 4-hydroxy as this fits the requirement for 4-hydroxylation in vertebrates. Secreted > extracellular space > extracellular matrix. Secreted > extracellular space > surface film. 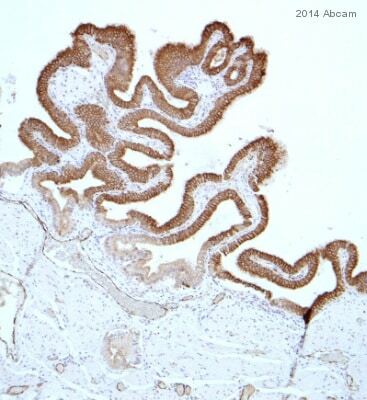 ab17781 staining Surfactant protein D/SP-D in human gall bladder tissue sections by Immunohistochemistry (IHC-P - paraformaldehyde-fixed, paraffin-embedded sections). Tissue was fixed with formaldehyde, permeabilized with 0.2% Triton X-100 in PBS and blocked with 5% milk for 30 minutes at room temperature; antigen retrieval was by heat mediation in Tris pH 9.0. Samples were incubated with primary antibody (1/500 in PBS) for 16 hours at 4°C. An Alexa Fluor® 594-conjugated goat anti-mouse IgG polyclonal (1/500) was used as the secondary antibody. Counterstained with DAPI. ab17781 staining Surfactant protein D/SP-D in human gall bladder tissue sections by Immunohistochemistry (IHC-P - paraformaldehyde-fixed, paraffin-embedded sections). Tissue was fixed with formaldehyde, permeabilized with 0.2% Triton X-100 in PBS and blocked with 5% serum for 30 minutes at room temperature; antigen retrieval was by heat mediation in Tris pH 9.0. Samples were incubated with primary antibody (1/400 in PBS) for 16 hours at 4°C. An undiluted Biotin-conjugated horse anti-mouse IgG polyclonal was used as the secondary antibody. 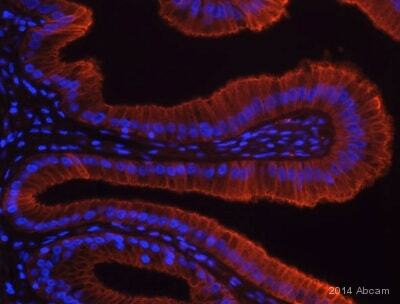 ab17781 at a 1/500 dilution staining perinatal mouse lung tissue sections by Immunohistochemistry (Frozen sections). The tissue was paraformaldehyde fixed and blocked with 2.5% BSA for 30 minutes. The antibody was incubated with the tissue for 16 hours and bound antibody was detected with an Alexa-Fluor ® 594 conjugated Goat anti-Mouse IgG antibody. This image is courtesy of an Anonymous Abreview submitted on 3 April 2006. 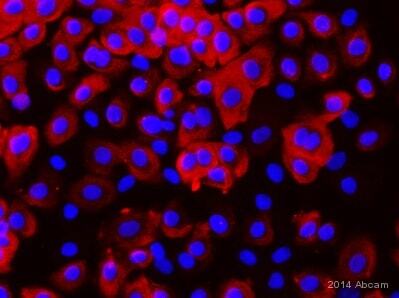 Do you have a Surfactant protein D antibody that works for IHC? Thank you for your phone call earlier today. I checked about the Surfactant protein D antibody you were looking for. We currently have several mouse monoclonal antibodies that may be suitable: ab17781, ab15696, ab15695 and ab15687 for example. I hope this helps, if you are looking for a different type of antibody please let me know and I will be happy to help you further.